As the season comes to a head, Leinster are aiming to finish strongly and claim a fifth Pro12 title. The win over Munster has put Leinster in command in the Pro12. LEINSTER HEAD DOWN the final stretch of the season in pole position as they look to end a muddled campaign with a fifth Pro12 title – and at this juncture each game is as significant as the next. It’s the ultimate cliché but it so often rings true at this stage of the year, particularly when the campaign hinges on the developments of the next few weeks. The universal party line coming from Leinster HQ is that they are taking each game as it comes and given the disjointed nature of what has gone before, it’s probably a wise approach. It’s been a funny season for the eastern province. Dumped out of Europe without turning up, they’ve been able to channel their efforts into the Pro12 for the last few months and it’s been reflected in the results, if not the performances. With just three games, including the visit of Edinburgh this Friday, of the regular season remaining, it’s very much crunch time for Leo Cullen’s charges as the next period offers them a chance of redemption. “There are a lot of high-achievers at this club and silverware is our bottom line,” defence coach Kurt McQuilkin admitted yesterday. “Once you get to a knock-out stage it’s about winning it, that’s what footy is about, winning and losing. “First and foremost, we hope to get to that knock-out stage and we don’t want to be relying on anyone else so we want to get there under our own steam and hopefully we’ll get that home semi-final. With Leinster’s European interest long over, the players were afforded a week’s break following the defeat of Munster and are now settling back into preparation for Friday’s assignment. Edinburgh will come to Dublin in search of points as they look to make one final push for a top-six finish and a place in next season’s Champions Cup. The Scottish side are one point behind sixth-placed Munster and McQuilkin expects the visitors to throw everything at Leinster at the RDS. “I think they’ll come out and throw the ball around because they have goals and objectives they want to achieve so we’re expecting a pretty torrid encounter. “They’re one of the top three defensive sides in the league so they’re going to be tough to break down and they’re a very good attacking side, they love to counter and offload a hell of a lot during post and pre-contact and they’re going to bring a lot to the party on Friday night. Leinster are currently tied with Connacht at the summit of the standings but head into the final set of games off the back of two defeats from their last three outings. With international players coming back into the fold following the Six Nations, McQuilkin admits the last few weeks have been a little ‘disjointed’ but now the pieces are falling into place. 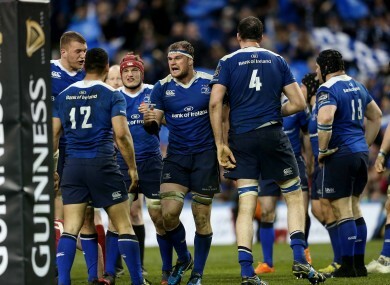 “We’d like to think so,” he replied when asked were Leinster finally clicking into gear. “We feel like now when we have the players together on a daily basis that we can only improve and it is a big heave and big change-up when you come back from the Irish scene and it can be a bit disjointed but we’re happy with how we’re going. “We’ve no preference [as to who we face], anyone can turn anyone over, no preference whatsoever, we just want to get there. “That’s my first problem – trying to get in the top four and then if we get a home semi then happy days and if we don’t we’ll set our stall out to face anyone. “A home semi is great from a lot of aspects. From a team aspect you’re playing in front of your home crowd in a tough encounter and from a Leinster point of view people can come in and watch a big game. Email “'There are a lot of high-achievers at this club and silverware is our bottom line' ”. Feedback on “'There are a lot of high-achievers at this club and silverware is our bottom line' ”.